The Jenson SEIS & EIS Fund, an early adopter of SEIS investing in 2012, has now invested in over 80 companies with a value in excess of £12 million. 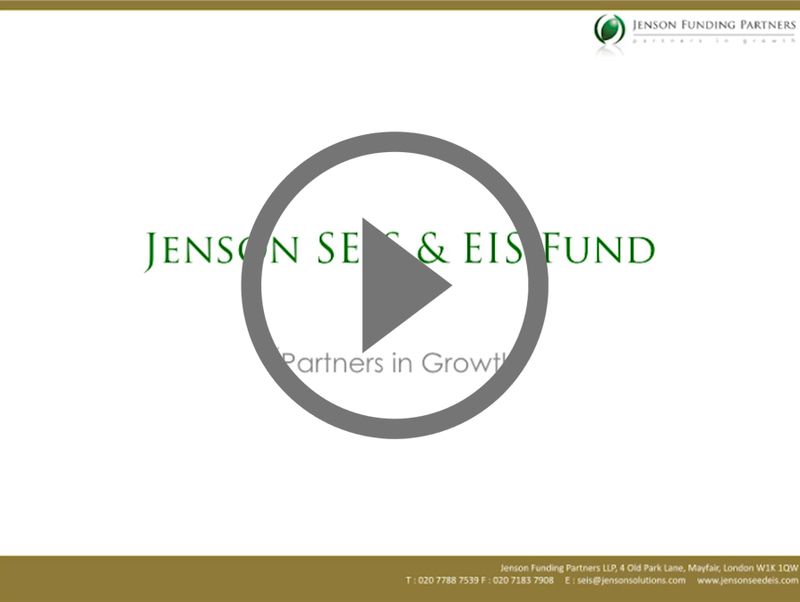 Jenson Funding Partners (JFP) supports the nurturing of these companies with both original investment via the SEIS and then follow on funding via the EIS. In addition, by accessing a team of over 30 Finance Directors in Jenson Solutions – their sister company – and contractual arrangements with other skilled professionals, we offer a lifecycle investment programme for our investee companies. More and more fund managers realise that earlier stage and high growth companies, whilst an attractive target area for investment due to the potential above average capital gains, require greater support and assistance than more mature investments. Partnering with Jenson Solutions, Foresight and Thompson Taraz, JFP has addressed these concerns through its role as an experienced provider of Finance Directors and support services to high growth companies. Important Information – *Performance is based on the combination of realised and unrealised value. Investments are illiquid until any of the underlying Investee Companies are sold or float on a stock market.Fund 1 has now achieved, as reported in the last ‘Fund in Focus’ a distribution of cash, with additional consideration on achieving the ‘earn out’ targets over the next two years. This distribution was achieved with the sales of the investee company ‘Twizoo’ to SkyScanner in September 2017. 1 = Original NAV: anything over 1 is potential positive returns. Risk Warnings: Past performance is not a guide to the future. 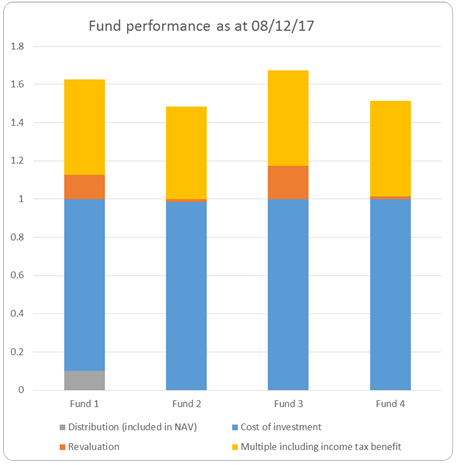 The data above shows net asset value of the first four SEIS funds and their corresponding EIS funds. It shows data since launch of each fund. The data was valued in accordance with International Private Equity and Venture Capital Guidelines which require investments to be valued at their fair value and include a number of techniques for doing so depending on the circumstances. 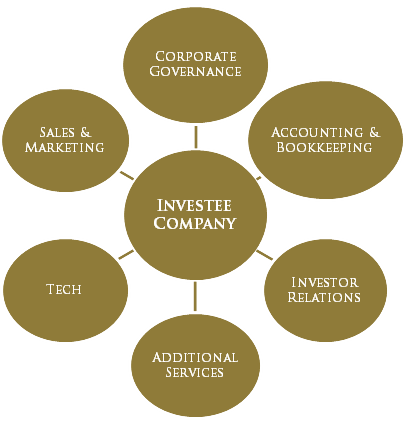 The Price of Recent Investment valuation technique is commonly used in a seed, start up or an early stage situation, where there are no current and no short-term future earnings or positive cash flows. For these enterprises, typically, it is difficult to gauge the probability and financial impact of the success or failure of development or research activities and to make reliable cash flow forecasts. *Fund 1 Date launched 2013 – performance over 4 years *Fund 2 Date launched 2014 – performance over 3 years. *Fund 3 Date launched 2015 – performance over 2 years *Fund 4 Date launched 2016 – performance over 1 year. » MICAP review: Available here, clicking here and downloading any associated Offer Reviews, you may receive a follow up call from a member of the Kuber Business Development team).